I would say this gives the appearance of transparency...It’s sort of fake transparency in a sense. Overall, the document leak provides a rare insight into the workings of the global offshore financial world, which is used by many of the world’s most powerful companies and government officials to legally avoid paying taxes and to conduct business away from public scrutiny. More than 120 politicians and royal rulers around the world are identified in the leak as having ties to offshore finance. The New York Times reported Sunday that the documents also contain references to offshore interests held by Gary Cohn, Trump’s chief economic adviser, and Secretary of State Rex Tillerson. There is no evidence of illegality in their dealings. In Ross’s case, the documents give a far fuller picture of his finances than the filings he submitted to the government on Jan. 15 as part of his confirmation process. On that date, Ross, President-elect Donald Trump’s choice for commerce secretary, submitted a letter to the designated ethics official at the department, explaining steps he was taking to avoid all conflicts of interest. That explanation was vital to his confirmation, because Ross held financial interests in hundreds of companies across dozens of sectors, many of which could be affected by his decisions as commerce secretary. Any one of them could represent a potential conflict of interest, which is why the disclosures, by law, are supposed to be thorough. The statement said Ross “has been generally supportive of the Administration’s sanctions of Russian” business entities. But the statement did not address the question of whether he informed Congress or the Commerce Department that he was retaining an interest in companies that have close Russian ties. In his submission letter to the government, Ross pledged to cut ties with more than 80 financial entities in which he has interests. Ross’s apparent ethical probity won praise, even before he signed the divestment agreement, from both sides of the political aisle. The documents seen by NBC News, however, along with a careful examination of filings with the Securities and Exchange Commission, tell a different story than the one Ross told at his confirmation. Ross divested most of his holdings, but did not reveal to the government the full details of the holdings he kept. In his letter to the ethics official of the Commerce Department, Ross created two lists: those entities and interests he planned to get rid of and those he intended to keep. The second list consisted of nine entities, four of which were Cayman Islands companies represented and managed by the Appleby law firm, which specializes in creating complex offshore holdings for wealthy clients and businesses. 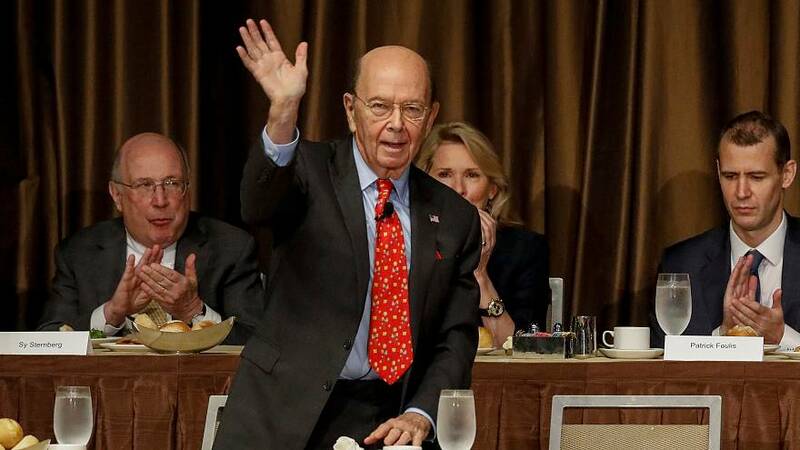 The Wilbur Ross Group is one of the firm’s biggest clients, according to the leaked documents, connected to more than 60 offshore holdings. The four holdings on the list of assets that Ross held onto were valued by him on the form as between $2.05 million and $10.1 million. These four, in turn, are linked through ownership chains to two other entities, WLR Recovery Fund IV DSSAIV L.P. and WLR Recovery Fund V DSSAIV L.P., which were listed in Ross’ financial disclosure prior to confirmation, but were not among the assets he declared he would retain. According to an SEC filing, those entities hold 17.5 million shares in Navigator, which constitutes control of nearly one-third of the shipping firm. The Office of Government Ethics, which is responsible for executive branch oversight, approved Ross’s arrangement, and it was left almost entirely unchallenged by the Senate. Sen. Richard Blumenthal, D-Conn., said members of Congress who were part of Ross’ confirmation hearings were under the impression that Ross had divested all of his interests in Navigator. Furthermore, he said, they were unaware of Navigator’s close ties to Russia. “I am astonished and appalled because I feel misled,” said Blumenthal. “Our committee was misled, the American people were misled by the concealment of those companies.” Blumenthal said he will call for the inspector general of the Commerce Department to launch an investigation. And a cursory look at Navigator’s annual reports reveal an apparent conflict of interest. Navigator’s second-largest client is SIBUR, the Russian petrochemical giant. According to Navigator’s 2017 SEC filing, SIBUR was listed among its top five clients, based on total revenue for the previous two years. In 2016, Navigator’s annual reports show SIBUR brought in $23.2 million in revenue and another $28.7 million the following year. The business relationship has been so profitable that in January, around the time Ross was being vetted for his Cabinet position, Navigator held a naming ceremony for two state-of-the-art tankers on long-term leases to SIBUR. The Treasury Department statement said that Timchenko’s activities in the energy sector “have been directly linked to Putin” and that Putin had investments with a company previously owned by Timchenko, as well as access to the company’s funds. Daniel Fried, who was the State Department sanctions coordinator under President Barack Obama, said the connection to Timchenko’s interests should have raised alarm bells. Another major SIBUR shareholder is Leonid Mikhelson, who, like Timchenko, has close ties to the Kremlin. One of his companies, Novatek, Russia’s second-largest natural gas producer, was placed on the Treasury’s sanctions list in 2014. Included in the Appleby documents are details of an internal discussion that resulted in the law firm dropping Mikhelson as a client in 2014, over concerns regarding his financial affiliations. A third shareholder of SIBUR – and deputy chairman of the board – is Kirill Shamalov, husband of Vladimir Putin’s daughter, Katerina Tikhonova. After the wedding, Shamalov’s meteoric rise to wealth led him to own as much as 21.3 percent of SIBUR’s stock until April, when he sold off around 17 percent for a reported $2 billion. “It’s a new generation which is currently being prepared and groomed… to inherit whatever power and wealth Putin’s team has accumulated over the past years,” said Vladimir Milov, a former deputy energy minister in Putin’s government who is now working with the opposition. Milov also said companies like SIBUR are often the way sanctioned Kremlin insiders have to keep doing business despite restrictions. The Commerce Department statement said Ross never met Timchenko, Mikhelson, or Shamalov. It said he was not on the board of Navigator in March 2011 when the ships in question were acquired, and said Sibur was not under U.S. sanctions now or in 2012 when the charter agreement with Navigator was signed. The statement said Ross was on the board of Navigator from 2012 to 2014, and that no funds managed by his company ever owned a majority of Navigator’s shares. Fried said he has no doubt of the connections between SIBUR and the Kremlin. Richard Painter, the chief White House ethics lawyer during the George W. Bush administration, said there needs to a close examination of whether Ross’ testimony to the Senate violated perjury laws. Painter also said Ross must recuse himself from all Russia-related matters because of the SIBUR connection.